Firstly let me start with a heartfelt Merry Christmas to all readers and followers of this blog, the fact that anyone finds our little corner of the internet a continuing source of wonderment after almost ten years in the game. We spent yesterday doing all things traditional which meant opening presents, eating a huge roast dinner and watching the latest festive edition of Doctor Who in the vague hope that it wouldn't be another vacuous waste of everyone's involvement. On that last score I think things went down rather well though I may have been feeling generous having just returned from a bracing afternoon walk at Rhossili. Conditions there were dull and windy to put it mildly but we had great views of at least a thousand Common Scoter sheltering off the leeward side of the headland. Given more time and subject to a little less battering we may have been able to pick out something even more exciting from the gathered masses but with black storm clouds rapidly approaching in off the sea we decided to make a run for home. All very well I hear you say but the title of this blog definitely indicated that a Hawfinch was in the offing and thus far I've seen no sign. Very true and with our garden feeders continuing to deliver I had hoped, rather optimistically it has to be said, that one might have dropped in for lunch by now. After all we've had just about everything else turn up this month including our latest arrivals, a small flock of Siskins, which flew in a couple of days ago and have been here ever since. No we were going to have to travel if we hoped to mop up any lingering birds from the recent influx and Margam looked like an ideal first destination. Regular reports have been coming in from the churchyard there throughout December but whilst flicking through Twitter last night I spotted a tweet that perhaps meant we should be searching a whole lot closer to home. 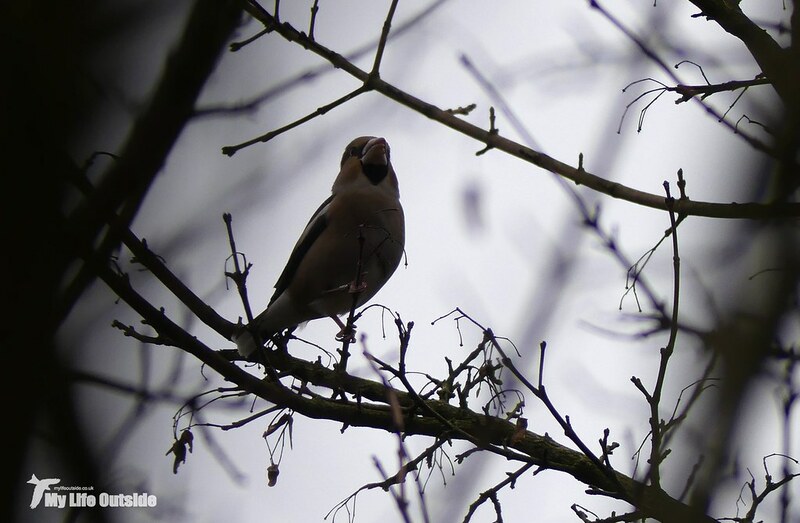 Apparently a single Hawfinch had been spotted just down the road in Gorseinon, within walking distance in fact, feeding amongst trees between Penyrheol leisure centre and the road! Clearly this needed investigating further. And that was how we came to be stood in a closed car park this afternoon beneath leaden skies and with a light drizzle just starting to fall. Temperatures had plummeted over night bringing a seasonal chill to proceedings, just what you need after half an hour of fruitless searching. In fact we were just heading back to the car when Emma spotted something in the top of a nearby tree, the very area from which earlier I'd heard an unfamiliar call that may or may not have been a Hawfinch (having never actually heard one before it was hard to be sure either way). Before I could get onto the bird however it took flight but I'd know that chunky build and white wing bar anywhere. We had an actual Hawfinch in the flesh, a lifer for Emma and technically myself as well if I discount vague memories of an encounter in Sandringham when I was much, much younger. Of course everything had happened far too quickly for me to even get a record shot on camera so we spent the next hour or so walking around the nearby park trying to relocate it. 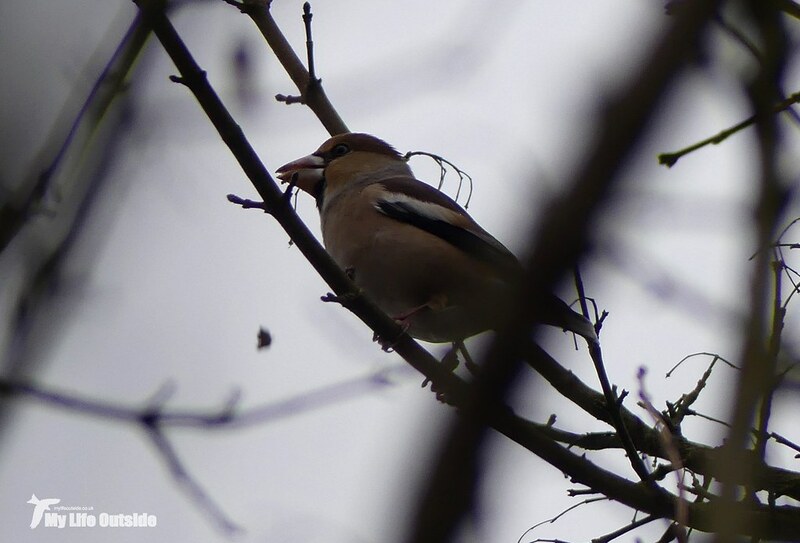 Bullfinches, Magpies and even a Sparrowhawk were all seen but of our Hawfinch there was of course no further sign. Until that is we returned to where our original sighting had taken place only to find the Hawfinch once more feeding along the roadside and this time looking far more settled. Needless to say I was ready with the camera and enjoyed a good ten minutes or so with the bird despite truly atrocious lighting conditions. Would you just look at that beak! What a stunner. Throughout our encounter I was treated to a whole raft of calls from the Hawfinch as well as feeding and preening behaviour and given the weather am pretty pleased to have managed any sharp images at all. Definitely a fine bird on which to round out the year as if the forecast is anything to go by we're not going to be getting out a whole lot between now and New Year.